After all, Drew is an expert at making offers a seller can’t refuse, and Jonathan is the king of finding ways to cut back the spending when unexpected expenses arise on a reno project. But in the episode titled “A New Perspective, a New Home,” a life-threatening situation changes everything. It seems that Jennifer and Alex and their two children, Hope and Quinn, have changed their priorities in light of Jennifer just having beat breast cancer. They want to spend more time together as a family, enjoying Canada’s great outdoors. The Scotts totally get it, and are committed to making the family’s dreams come true. Their current home is relatively new and in good shape, but the layout needs a few tweaks, and the kitchen (as usual) needs to be opened up and modernized. Jonathan thinks he can do this for $65,000 in only four weeks’ time. If all goes as planned, the house, which is currently worth about $880,000, will be worth closer to $1 million. 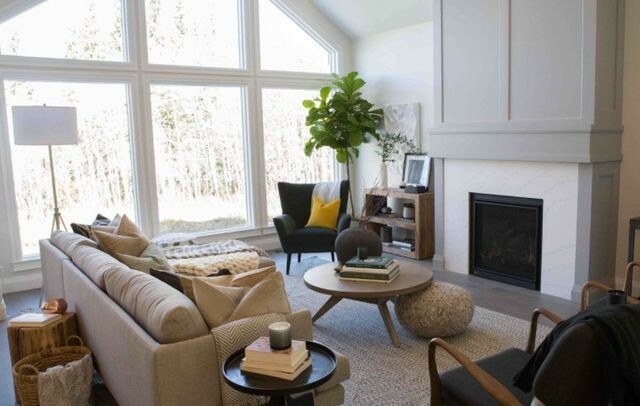 In the process of helping this family get everything they want, the “Property Brothers” stars share quite a few tips that can help the rest of use get everything we want in our own homes. Take a look! Light wood planks freshen up the place considerably. Jonathan loves a good quartz countertop, as it’s less expensive and more durable than marble, but can look identical. That’s why he decides on a quartz surround for the gas fireplace he’s installing in the family’s current living room. Quartz surrounds the new fireplace in the family room. Some people look at pillowy stools, known as poufs, as silly, impractical, and superfluous. But Jonathan realizes a bold-patterned or -colored pouf can add interest and additional seating without taking up much floor space. Sure enough, when potential buyers tour the renovated home, they rave over it. Alex has spent a lot of time in the great outdoors collecting fossils, and has shelves full of dinosaur teeth, bones, and ancient skulls on display in the family room and dining area. While fascinating to some and tastefully displayed, they’re not all that attractive to potential buyers, according to Drew, and distract from the home’s other good qualities. Drew suggests boxing them up and storing them until he finds them a new home where the fossils can be displayed again. Jonathan suggests painting the front office in the family’s home a “dark charcoal green,” which he says looks “sophisticated.” That’s especially true when he brightens it up by staging it with colorful prints and mirrors, as well as hanging an intriguingly shaped, modern chandelier in the center of the room. Result? That drab office becomes one of the most striking rooms in the house. 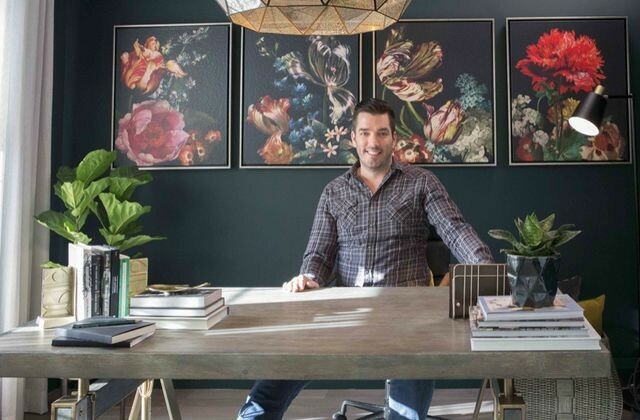 Jonathan Scott shows how dark-colored walls can be sophisticated. Sometimes you just have to buck the adage that “bigger is better,” especially in the case of this family. Drew shows them a lovely home that sits on a 2-acre wooded lot, so they could have outdoor adventures without leaving their own property. But Alex considers what it would take to maintain all that land, and he decides against it. He’d rather spend his time enjoying his family than doing yardwork. Drew finds the family a gorgeous, big, bright, beautiful, turnkey modern home with trails within walking distance—and it’s literally a stone’s throw from their old house. It’s perfect in every way except for the price, which is about $50,000 above what they’ve planned on spending. Drew explains that “when you look at the $50,000 over the course of a mortgage, it’s only a couple hundred more per month.” Besides, they believe Jonathan’s remodel will render more money than they’d anticipated when they’d set their budget, so they decide to offer the full list price of $1,249,000. Jennifer and Alex decide that after all they’ve been through, they deserve to enjoy their true dream home, and the seller accepts their offer. Meanwhile, Jonathan has done a great job on the renovation and Drew decides to price it conservatively at $999,999. Sure enough, that conservative price drives multiple offers, the family accept the highest bid, at $1,005,000. Now they can “live life to the fullest and spend time with the ones who count—family,” says Drew, as he places the “Sold” sign out front. All’s well that ends well for this sweet family.